Rosasite forms in the oxidation zones of zinc-copper deposits. It typically is found as crusts and botryoidal masses or nodules. Crystals are fibrous and found in tufted aggregates. The color is an attractive bluish green. 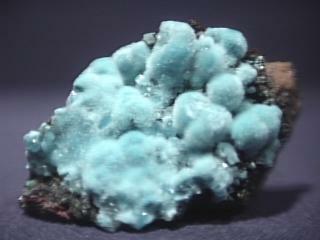 Rosasite is associated with red limonite and other such colorful minerals as aurichalcite, smithsonite and hemimorphite. Nodules of rosasite certainly add color to what are termed "landscape" specimens. Rosasite can be confused with Aurichalcite, (Zn, Cu)5 (CO 3 )2(OH)6 . However rosasite is usually more massive but not lamellar. Rosasite crystals are harder than aurichalcite; 4 versus 1 - 2 respectively. Color is usually a bluish-green to green. Luster is silky to vitreous to dull for massive specimens. Crystal Habits include radiating tufts of fibrous crystals. It typically is found as crusts and botryoidal masses or nodules. Cleavage is perfect in one direction but not usually noticed because of fibrous crystal habit. Streak is pale shades of bluish green or green. Associated Minerals include limonite, smithsonite, hemimorphite, malachite, aurichalcite and calcite. Other Characteristics: Effervesceses easily in cold dilute hydrochloric acid. Notable Occurrences include Arizona, New Mexico and Inyo Co., California, USA; Rosas Mine, Sardinia, Italy; Tsumeb, Namibia and Mapimi, Durango, Mexico. Best Field Indicators are crystal habits, color, associations, hardness and reaction to acid.